Last week, we discussed our team’s experience designing curved staircases for sorority homes across the country. This week, we continue the discussion with three additional examples of luxurious round stair design. 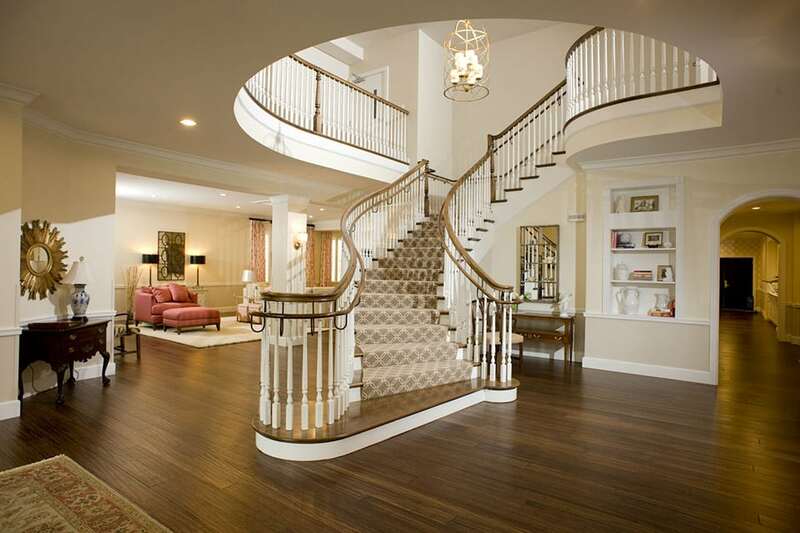 How do curved stairs fit the sorority home style? Curved stairs can be described in many of the same words often associated with sorority homes and sorority members themselves: lovely, admirable, accomplished, charming, appealing, darling, stylish, chic, and sophisticated. Beautiful and functional, round staircases often serve as a centerpiece of their homes. Their structure and elegance create natural gathering places for group photos, celebrating family and home while creating memories for years to come. In addition to their classic style, our curved commercial staircases also offer lasting quality and durability, key to safety in a high traffic area such as a sorority home. With extensive use in mind, superior construction is key. Our industry leading design team and expert craftsmen ensure a stable, safe stairway with luxury aesthetic quality. All of our sorority curved stairs feature a guard and grab handrail system adhering to commercial stair code. Last week we highlighted two curved stairs at the University of Alabama. Today, we showcase sorority home staircases at three additional SEC universities. 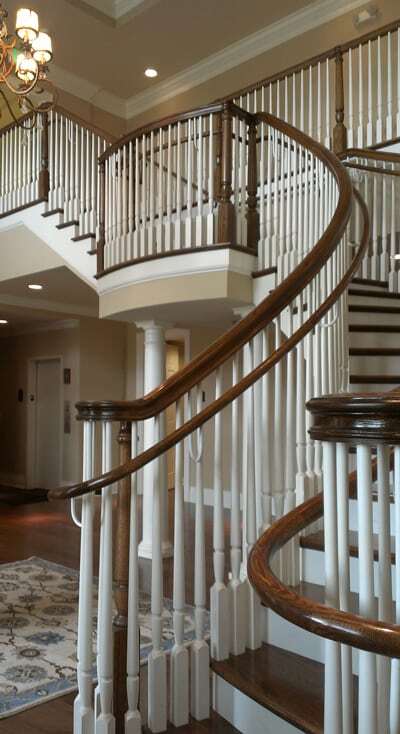 See for yourself how well a curved staircase accents the classic design of a sorority home. As we leave Alabama and travel north, we arrive at the University of Tennessee in Knoxville to find another elegant wooden curved staircase. This curved stair flows gracefully to a picturesque landing, further ascending to a straight balcony system. Featuring red oak treads in a rich finish with paint grade risers, this stair’s design is ideal for that charming traditional style. The stair is completed with a Regency handrail system in red oak, accented by turned Charleston newels and painted balusters for a clean, classic look. From Tennessee we travel to the Midwest, where we find the University of Missouri in the heart of Columbia, Missouri. Featured in Southern Living Magazine, this luxury stair is beautiful and charming, complementing the overall style of the home. Though the individual components of this staircase are simple, together they create a stunning overall appeal. The double opened, curved staircase with a turned wood baluster system features classic Regency newel posts and handrail in white oak, matching the curved treads. The system is completed with coordinating regency balusters in a white, paint grade finish. Finally, we reach our last staircase of the day. Now installed at the site of a sorority home under construction at the University of Florida, this beautiful commercial staircase – along with the other systems – was constructed at our state of the art facility in Atlanta, Georgia. This stair features curved to straight transitions, requiring absolute precision, skill and expertise to ensure a perfect fit. The stair will be finished with a wooden baluster system including a Classic mahogany handrail with Regency newel posts and balusters. Upon completion of this Gainesville, Florida sorority home, this stair’s wood baluster system will be the perfect finish to give the house a lasting impression for years to come. Stay tuned for finished project photos to come in upcoming months! Visit our curved stairs project gallery for additional details and pictures on our exquisite projects. From inspiration to installation our team is committed to designing and building the highest quality curved stairs. Our reputation speaks for itself and client satisfaction is our highest priority. Contact us today to discuss your next custom stairs project.